Many customers appreciate the convenience of obtaining their seed requirements from our agencies. Advice is readily obtainable regarding aspects such as species selection for local conditions, site preparation requirements and seed availability. Canberra and Southern Tablelands – A range of seeds suited to the local conditions is available from Mr. John Weatherstone of “Lyndfield Park” Gunning (ph: 0438 451 282, e-mail: lyndfieldpark@gmail.com). 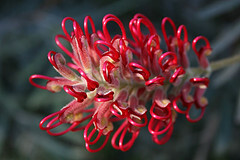 Mr Weatherstone has had extensive experience in tree establishment and the direct sowing of native plant seeds. Hunter District – Our seeds may be obtained through Kirkwood Produce Co. Pty. Ltd., John Street, Singleton – phone (02) 6572 2766, fax (02) 6571 1799. This well-respected firm has serviced the Upper and Lower Hunter Valley since 1921. Mr. Marcus Kirkwood will be pleased to advise on the availability and supply of our range of native tree and shrub seeds, particularly those extensively used for site revegetation in the Hunter Valley. The colour images on this site, with the exception of the home page and banner image, were taken by Marj K. and are available on Flickr. We thank Marj K. for allowing us to reproduce them here.